I finished this book a few days ago and I've been struggling with how to express my feelings about this. There are so many wonderful things about this book...and then there are other things that just keep me from completely loving it. I think we all know that Alexander Hamilton is having a moment right now, and rightly so. As a history buff (and major--from the same university as one of the authors! ), I've always liked the guy and I'm glad that he's finally getting his due. I'm also eager to dive into works about him, which--strangely--may have led me to not enjoy this book as much as I otherwise would have. Let me start with what I enjoyed. The writing is just wonderful. I'm more than a little wary of novels with more than one author as sometimes it you can painfully tell when one writer stops and another begins. I don't know how Dray and Kamoie wrote together, but they were able to come up with a unified voice that is readable and poetic. The Epilogue is especially beautiful and I'm glad that the book ended on that note. They also have their history down. Very little of this was new to me, but I was still interested in all the details they included and I felt that they were able to clearly outline some rather complicated situations. Most of the time--I'd say about 80% of the time--they are able to seamlessly weave facts and dates into the narrative, although the rest of the time did tiptoe into info-dump territory. While I enjoyed this book more often than not, there were things that just didn't sit well with me. One of these things I worried would come to fruition when I first started the book. I have found that it is incredibly tricky for a historical biographical novel to be told in first person, especially when the subject is more of a history-adjacent character. What tends to happen, and does happen at times here, is that the main character becomes overly important against the actual history. There were times when it almost seemed like Eliza Hamilton was the impetus for events in which, in actual history, she had no involvement. 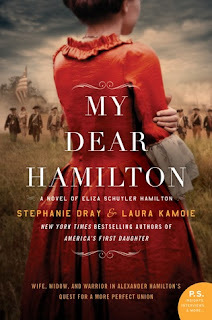 This book seems to assert that Alexander Hamilton would not have been Alexander Hamilton, had it not been for Eliza. While that idea is definitely true for some couples in history, it really isn't the case for the Hamiltons. Eliza was not the sort of woman who molded her spouse and it wasn't until his death that she truly came into her own. This problem is usually easily remedied by putting the book in third, rather than first, person and I think the authors could have successfully told this story that way. And that brings me to another irritation. 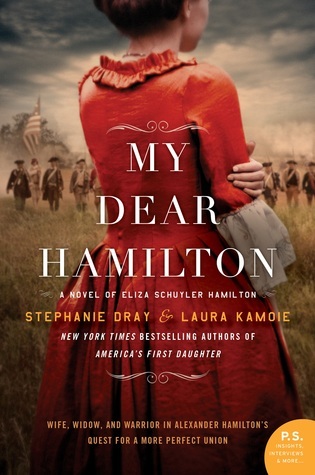 The most fascinating part of Eliza Hamilton's life, and of this book, is what happened after Alexander died. Of an approximately 600 page book, only the last 100 or so pages deal with that. Considering that was over 50 years of her life, and when she did most her work, I felt robbed of what I really wanted from this book. I already know about Alexander Hamilton and there are plenty of other works that go into his life, so I feel that Dray and Kamoie missed a real opportunity here. My final complaint is one that I realize is probably quite personal, but I still feel it needs to be addressed. I started this book on March 18 and finished it on March 31. On March 24, I saw the musical Hamilton. I loved Hamilton and have nothing but wonderful things to say about it, but I also recognize that it is a completely different animal from a historical novel. Because the musical was so fresh in my mind, I was aware when parts of this book seemed a bit derivative. There were lines of dialogue that were similar, but not exact, to lines in the show and certain moments that were featured in the musical were strangely emphasized here. I realize that if you have seen Hamilton, or even haven't seen it recently, this will not even be an issue. However, for me, it set off a whiff of fan fiction that lingered throughout the book which seemed to cheapen the reading experience for me. This book was strong enough that it didn't need tiny nods to a modern work. Despite all these complaints, I did quite enjoy this novel. As far as historical novels go, this one is one I would recommend, even with the bits that irritated me. I just wouldn't recommend reading it right after seeing Hamilton. Find out more about Stephanie at her website, and connect with her on Facebook, Instagram, and Twitter. 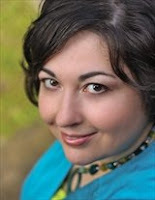 Laura Kamoie is the New York Times, Wall Street Journal, and USA Today bestselling author of historical fiction. She holds a doctoral degree in early American history from The College of William and Mary, published two non-fiction books on early America, and most recently held the position of Associate Professor of History at the U.S. Naval Academy before transitioning to a full-time career writing fiction. Laura lives among the colonial charm of Annapolis, Maryland, with her husband and two daughters. Find out more about Laura at her website, and connect with her on Facebook and Twitter. Are you interested in reading more about this book? Check out some of the other stops on the blog tour!